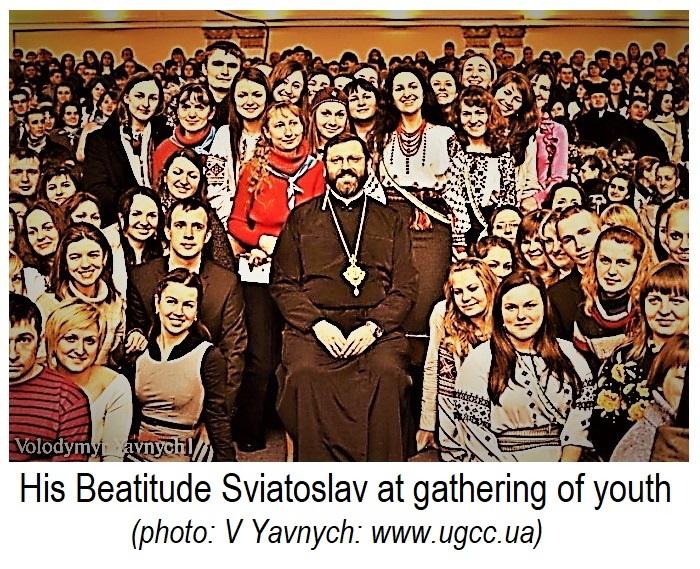 Beloved in Christ Youth in Ukraine and Throughout the World! With great joy, as every year, on the occasion of Palm Sunday commemorating Jesus' triumphal entry in Jerusalem, I wish to address you with this pastoral message. For indeed youth, in the words of Pope Francis, is the divine "now" of our Church and people to whom God wants to reveal His presence, His mercy, and His salvation. As Christ did then, when He entered into His royal city and inaugurated the triumphant coming of His Kingdom in humble service, so also in His eternal "now" through you He wishes to carry His light and His hope into the world. The future depends on your openness to Christ, your sensitivity to the living reality of your Church and people, and your ability to take on responsibility for yourselves and the world. According to recent sociological surveys, the majority of young Ukrainians see freedom as the most important value in their life. It should be pointed out that this is also the position of a great part of the adult population. For post-Soviet Ukrainian society, such a shifting of values can be seen as a real breakthrough. Indeed, after decades of captivity and bloody communist terror, the freedom-loving spirit of our ancestors has awoken, a spirit which until now no enemy could break or extinguish. This is not surprising, for true freedom gives us the possibility to express our dignity, to fulfil our noble aspirations and goals. It enables us to feel free from all kinds of enslavement so that we might live in truth and create what is beautiful and good. As my predecessor, His Beatitude Lubomyr, aptly stated: "freedom is the possibility to create the good." As the year 2013 drew to a close, they sought to deprive us of the possibility to fulfil our national dream-the dream for a free, united, European Ukraine. And it is not by chance that opposing forces chose as their target none other than the youth. Church bells awoke our conscience, and on the Maidan, with great cost, we defended our right to do good in freedom, to live in liberty on our God-given land. Among the heroes of the Heavenly Hundred were our colleagues-students, sportsmen, volunteers, young parents. From the divine eternal "now," they look down on us today in order to once again by the bells of our conscience awaken us to sensitivity and responsibility. Today our freedom is being preserved before the Russian aggressor by those fighting in the Eastern part of Ukraine at great cost and personal sacrifice. We have no right to stab them in the back. Beloved in Christ! Freedom is not merely a human value, of which no one has the right to deprive us. True freedom is a gift from God which we received in Jesus Christ. St. Paul reminds us: "for freedom Christ has set us free," and he immediately cautions us, "stand firm, therefore, and do not submit again to a yoke of slavery" (Gal 5:1). Entering into the capital city of Jerusalem, the Lord brings the good news of salvation, the good news of freedom. This freedom he proposes not as one who enslaves and oppresses. Throughout our national history, especially in the last century, we were visited many times by "liberators" who, hiding behind deceptive slogans about equality and freedom, brought with them terror, destruction, and death. Christ, on the other hand, in humble service by which He gave His life on the cross for our liberation and freedom, becomes the source and foundation of authentic divine freedom, which brings peace, gives hope, calls to growth. "For you were called to freedom, brothers. Only do not use your freedom as an opportunity for the flesh..." (Gal 5:13). This call to growth in freedom is at the same time a call to mature responsibility. For today the enemy of our salvation-personal and national-once again seeks to lull our sensitivity. He wants us to see freedom as a right without personal effort, for us to "go with the flow," while setting aside high aspirations and ideals. True freedom is not possible without responsibility. Freedom without responsibility, in fact, becomes a blind and destructive force, а recklessness that closes its eyes to that which has been achieved thus far, destroys the present good-personal and common-and places in doubt the personal and national "tomorrow." During the triumphal entry into Jerusalem, it was the youth that joined the ranks of Christ's disciples and revealed their openness of heart and responsibility in the face of epochal changes and upheavals. Dear youth! Today's Gospel event teaches us to choose with maturity and responsibility-to stand on the side of truth, goodness, and justice, to stand against manipulations, cunning propaganda, and empty promises of an easy and carefree future. The history of salvation shows all of us that the path from slavery to freedom is difficult and long, and it must be travelled from day to day, steadily and patiently. There may be mistakes made on this path, but it would be awful for us to fall into an ill-conceived indifference and thoughtlessness by which we, often even unawares, cross over to the side of our enemy, having freely submitted once again to his tyranny. Today in Ukraine we are demonstrating our national and Christian maturity through our participation in the elections for President of Ukraine. For some of you, this is, possibly, the first election in your life. This same day may become decisive for the fate of the county for decades, and even for its very existence. Therefore, I call upon you to mature responsibility. Only a mature person is capable of foreseeing the consequences of one's choices and take personal responsibility for them. Let us not let anyone take Ukraine for a fool, scoff at the blood and suffering of our people, who fight for true freedom at the cost of their own life. The young faithful of our Church, who reside outside Ukraine and are not participating in the elections today, I wish to also call to responsibility in our communities-ecclesial and social. Take responsibility for the future of the country where you reside, do not be afraid to achieve success and perform service at the highest levels of society and thus to be a source of pride for your native people and your Church. Become active members of your parish and the Ukrainian community. And so will you, as the divine "now" will create a better future for yourselves, your descendants, the Church and all of humanity. My dear youth! I greet you with this special youth day! Thank you for your active, mature, and responsible Christian life position. Be assured: those who follow Christ and throughout their life walk in the ways of God, such persons will always achieve the blessed goal of true freedom and happiness, which never pass away. on the Day of Venerable Mark, Bishop of Arethusa, and Deacon Cyril, and others martyred by the persecutor Julian, April 11, 2019 A.D.